Born February 28, 1963. Graduated from the "S.S. Cyril and Methodius" University in Veliko Turnovo, Bulgaria, Department of painting, in 1989. Member of the Union of the Bulgarian Artists, affiliated to the IAA/UNESCO. 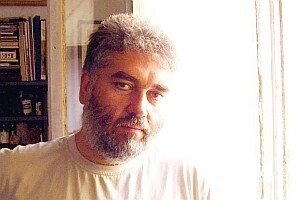 Chairman of the Group of the Artists in Pleven. Lives and works in Pleven, Bulgaria. Married. One daughter - Petya. Works in the sphere of painting, graphics and graphic design. During the past years his work is directed to the fantastic myth-folklore world of the Bulgarians. The eternal male and female beginning and the fight between evil and human spirit are treated in the myth-folklore cycle. Woodnymphs and mummers are some of the most frequently used characters of the Bulgarian folklore. Cultural variety - from heathen-mytological through ritual-folklore to biblical-Christian symbolism - is revealed in the compositions. The artist's colouring is inspired of multi-coloured nature and Orpheus land. The pictorial construction is in richly shaded and harmonious tones suggesting warmth and expressiveness. The deformation is intentional and leads to a naive manner subordinate to the irrational. Web design by VM & SK All rights reserved.